How can specific Pilates-based balance exercises improve your balance you might wonder? When you think of loss of balance you may have visions of elderly people, which might just be you. C.	Not practicing specific exercises to improve our balance as we age. The four exercises listed below meet the requirements for improving specific muscles for balance, posture, and improving your flexibility and body awareness. 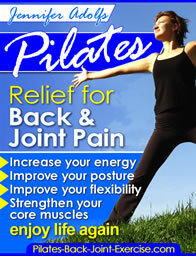 These and over 15 more Pilates-based exercises are compiled for you in the newly revised Pilates ebook available here. Why it helps? This is one of the balance exercises that targets specific balance muscles in the legs and ankles. It helps to strengthen both your legs individually, and to help balance and center the core areas of your body such as your trunk, pelvis, and scapulae. You may notice you have an easier time balancing on a certain side. That's why it is so important for you to strengthen your legs individually, to bring balance to your body. Position: Stand tall and neutral (ears over shoulders, over hips, over knees, over ankles, chest lifted and arms relaxed at your side). Distribute your weight evenly through both feet between your big toe and pinky toe and the heel. Action: Inhale and feel the length up through your spine, zipping up the abdominals like putting on a tight pair of jeans. Keeping your pelvis (hips) level, you may want to place your hands on your hip bones. Do not tip, but shift your weight over one leg as you lift the other leg. Hold for 5 counts and then switch to the other leg. Notes: Keep thinking of lengthening your spine and waist, standing taller and keeping your hips level as you lift up out of them. Once you are stable on one leg, you can begin moving the other leg while remaining stable. Try Leg Swings and Leg Circles! Action: Stand in neutral on one leg and swing the other leg forward and back, keeping your hips quiet and even. Repeat 4-8 swings on each leg. Action: Stand in neutral on one leg with your arms floating out to the sides. Extend the other leg in front of you, to the sides, and back, then make small circles, staying lifted up and out of your stable hips. Repeat 4-8 circles on each leg at each position. Why it Helps? This balance exercise warms up your feet and ankles by increasing blood flow to your feet and legs, which, in turn, improves your flexibility. I always start my Pilates classes with this standing exercise. Because our feet are the foundation of our body from which everything else moves our work should begin here. When you pull your toes off the floor it strengthens the most important muscle for balance, the dorsiflexor, on the top of your foot. You will definitely feel the pull there when you do this several times. Try tapping your toes sitting or standing 50 times or to the point of fatigue. Find this exercise and many more designed to strengthen and stretch your feet in the new Foot Ebook available here. Position: Stand tall with your feet under your hips and weight distributed evenly between your big toe and pinky toe and into your heels. Action: Rock up onto the balls of your feet and then back on your heels pulling your toes up off the floor. Keep your body tall and in line, only moving your feet and ankles. Hang on to something if you need to. Repeat this exercise up to 20 times or until you feel a warming or burning sensation heating your feet and the lower part of your legs. Notes: Imagine being drawn to the ceiling by the top of your head. This is one of those balance exercises that may seem difficult at first but with practice will get easier. Why it helps? This standing Pilates exercise teaches you to rotate your spine and release tension in your upper back. This tension can cause bad posture that can throw off your center of gravity and, in turn, your balance. The spine twist as one of the balance exercises will help to improve flexibility in your torso. As you stretch your upper back and ribcage muscles you will also strengthen the muscles at your waist allowing you to stand taller and with better body awareness. Position: Stand with your feet hip width apart and arms extended out from your shoulders with soft elbows. Action: Keeping your hips facing forward, inhale as you twist at the waist, then exhale to twist back to start position. Your eyes should follow the hand that is reaching back as your head turns with the rest of your spine. Notes: Keep your shoulders aligned over your hips. You should feel space between your ribs and hips like a hot air balloon floating up over its basket. Feel yourself wringing out at the waist like a wet towel. Caution: If you have stenosis, osteoporosis or any pain in your spine, make sure that your whole body turns together (hips turn with you). Why it helps? This is one of my favorite balance exercises and my students can feel it working their whole body. It especially helps to improve posture and all the balance muscles are working from the core by strengthening and lengthening your arms and legs. Position: Stand against a wall with your feet about 6 inches away and shoulders, head, and buttocks in contact with the wall. Extend your arms out from your shoulders with soft elbows. Action: Leaning into the wall, start to shift your weight over one leg as you extend the other out to the side, like you are tipping sideways. Extend your arms, legs, and head out from the core of your body, stretching yourself into five points like a star. Keep your shoulders, head, and bottom against the wall at all times. Now shift your weight to the other leg and repeat the action. Do this 4-6 times on each side. Notes: Pull your abdominal muscles in as you extend your five points out from the center of your star. Leave Balance exercises and find out more about how Pilates can benefit you here.